I am helping a friend to solve a low and not so clear sound to his car's audiosystem, when using aux-input in particular. He is getting great signals from CD or Radio, but when he feeds the audiosystem with analog in, it sounds "okay" but low. I have tried different quality cables and signal medias such as mp3, flac, WAV and streaming from youtube. Even with high quality cables and high resolution media files like flac, it did not sound as good as CD. I even tried with different phones, but still not satisfied. And then I suddenly thought of this idea: "What if we transmit the data from the phone to a DAC (with a mini amp inside) and then further to the car's audiosystem." Would not that be awesome? I understand it is not easy to imagine how it will sound untill you try it. 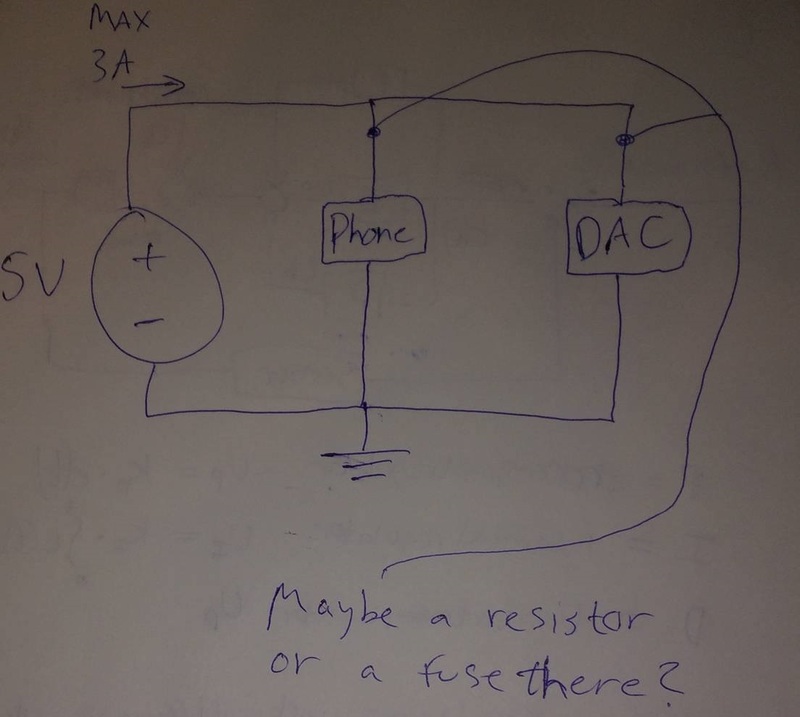 Therefore I drew couple of sketches on how to approach to a solution to the problem and also how to supply the DAC and the phone with power while the phone and the DAC exchanges data. All those three components interacting simultaneously. The third component here is a node (power source) from the car which is then transformed with a buck converter from 12V to 5V. Transformer can supply MAX 15 W power. That means it can supply max 3A current, from P = UI formula. On second sketch I wonder if it would be necessary with a fuse or resistor next to the phone and the dac (in series with each of those to components, just like pointed on the sketch). My last question is would it be necessary with a resistor or a maybe a fuse or will those components drain as much as they need so I can expect it to go fine? If yes, which kind of resistor will be suitable? What else would to do or not do to make this idea easier and realizable? Hello, are you sure it's not just that the aux port is broken?